SSC CGL Exam Pattern 2018:- SSC CGL 2018 Pattern change news is officially declared on the SSC Website. SSC board going to change the pattern according to Official News. Students who are going to appear in the CGL examination this year should first have a glimpse of the SSC CGL Exam Pattern first and the weightage of each portion so that they can make the strategy. Combined Graduate Level (CGL) Exam 2018 Tier 1 and Tier 2 New Pattern & SSC CGL New Exam Pattern 2018. Latest News Updates Related to SSC CGL 2018 Exam Pattern Tire-I New Pattern and SSC CGL Exam 2018 Patten. The First Change in SSC CGL is it Change the Exam Mode Means SSC CGL 2018 Conduct via the Computer-based online Test. we will update the SSC CGL 2018 Exam Pattern tire 1 Syllabus Soon Visit the Website Again and BookMarks Page. Board every year makes some changes in the exam pattern. Each student should check it so that they may have an idea about the pattern. Below complete details are shown properly. Note:- SSC CGL Tire 1 and Tire Conduct via the Computer-based Test (Test) Online Examination. There will be negative marking of 0.50 for each wrong answer in Tier-I. In respect of Tier-II, the negative marking system will remain unchanged. Time Duration of Tier 1 is 75 Minutes (Total) and 100 Minutes For VH and candidates suffering from Cerebral Palsy. 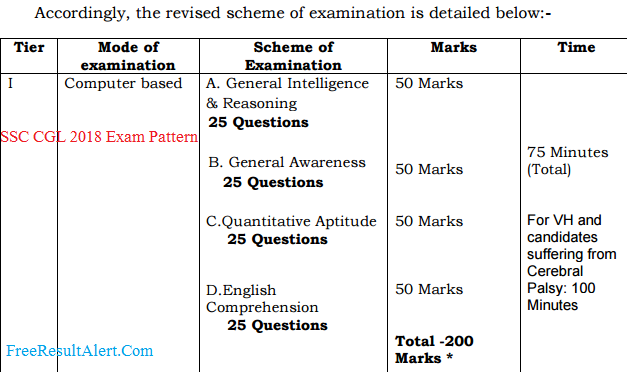 Students can check the SSC CGL exam pattern details from the table given here. Check the complete or full exam pattern and syllabus details of SSC CGL Tier 1 & 2 exam pattern. Negative Marking:- 1/4th for Each wrong answer. Candidates if you want to receive any updates Related SSC CGL 2018 Exam Pattern. You can join us on facebook or Google Plus. we will send the latest news related to SSC CGL Exam Pattern & Exam Date. Candidates Check here the SSC CGL Exam Pattern Changed News SSC CGL 2018 tire 1 Exam Date. If Students have any Doubts Related to SSC CGL 2018 Discuss here Via the Comment Box Without any Hesitation. I want to know that we have to qualify tier 1 in all section of tier 1 paper or combined paper? SSC CGL Admit Card will be available very soon. the Exam dates are 27th August to 11the september. * If you are appearing for SSC CGL Tier 1 Examination from 27 August to 4 September, your admit card will be available for download from 16 August onwards. * If you are appearing for SSC CGL Tier 1 Examination from 6 September to 11 September, your admit card will be available for download from 27 August onwards. * SSC will not conduct Tier 1 Written Examination on 5 September 2016.
sir.how many years ones SSC cgl syllabus 2016 change…. kindly tell me about syllabus..
the latest notification is showing that there is english comprehension section and general awareness section…Are they different from the former one i.e. english language and general studies? Can every post carry tier3 test . If not then give us the name of post who carry tier3 exam . Sir I want to know.is ssc cgl tire 1 is just qualifying exam or marks will be added after tire2? Hello aspirants, Is TIER 3 compulsory for all posts under SSC CGL 2016 as per revised pattern ? Will the marks of tier1be added in final result of cgl or not? Or is it only qualifying nature? Will the syallabus of ssc cgl tire 1 change? no there is no changes in SSC CGL 2016 tier 1 syllabus.Only pattern is changed. How long will they take to declare the changes officially ? But nothing as such is confirmed by ssc till date this news seems fake. Thank You For appreciate My Team Work.